Chris Ogden explores the relationship between the UK and India and argues that, going forward, both nations must focus on current shared interests rather than harking back to negative legacies of coloniser and colonised. He also highlights that as India becomes increasingly powerful on the world stage, the UK must position itself carefully to ensure future recognition and favour. The last decade has seen Britain-India relations intensify in ways unimaginable in the immediate aftermath of independence or during the Cold War, when London regarded Pakistan as the more viable regional partner in South Asia. Largely freed from geo-strategic machinations and aided by clear co-dependencies, ties have strengthened. Characteristic of this new epoch, trade levels are rising considerably, with bilateral exchanges in goods and services increasing from £5.09 billion in 2001 to £16.43 billion in 2013. With a middle class now numbering over 300 million, and a retail sector doubling in size every three to four years, India offers clear opportunities for UK businesses. 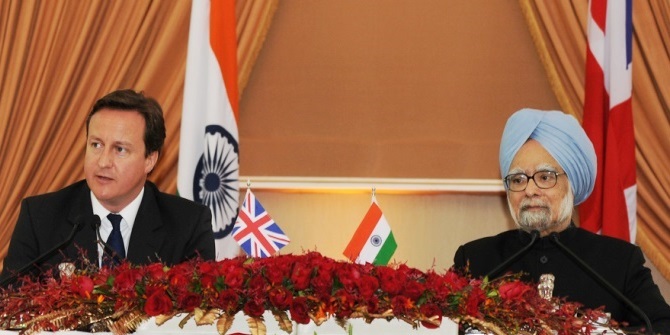 These factors were a major spur for David Cameron’s high-level trade mission to India in July 2010, which saw the largest trade delegation ever taken abroad by a British Prime Minister. New Delhi’s domestic modernisation drive – commensurate with global ambitions to be a great power – adds extra urgency to desired British investment. Investment is critically two-way, including the £6.2 billion takeover of Corus by India’s Tata (thus becoming a major UK employer) and the £7.4 billion acquisition of Hutchinson by Britain’s Vodafone, both in 2007. Defence sales compliment burgeoning trade relations. This push is underpinned by India being the world’s largest arms importer from 2007 to 2013, accounting for 10% of the global total. The investment is seen as key to India’s modernisation and regional hegemony ambitions and the active promotion of closer defence ties has seen the sale of missiles, helicopters, underwater surveillance systems and a 2003 deal comprised BAE Hawk jets and small arms worth £670 million. Multiple exercises, exchanges, training courses, visits and counter-piracy operations compliment these links, and their first joint military exercise (named Emerald Mercury) was held in India in March 2005. Positive ties are bolstered by intelligence co-ordination, including advice on strategic incident management and counter-terrorism – such as for the 2010 Delhi Commonwealth Games and the 2012 Olympics in London. Beyond economic and military parameters, residual strengths continue to provide areas of sustained strategic convergence and co-dependence. Core political values maintain their relevance, particularly in the post-9/11 era, concerning democracy, pluralism and tolerance. These positive linkages underpin dialogues on sustainable development and climate change, and forging collaborative policies in international negotiations. In addition to continued culinary and cricketing ties, the British-Indian community continues to be an influential group in the UK – numbering around 2 million. India is the second highest source of overseas students in British universities and in January 2013 there were 8 Indian origin MPs and 24 Indian-origin Lords in the British Parliament. The status of Kashmir remains as a deep-rooted obstacle to unfettered relations, with Indian sensitivities concerning unwanted external influence being prominent. Typical of this view, in 2009 officials dismissed Foreign Secretary David Miliband as “a young man” after he appeared ignorant of regional dynamics. Revealingly, as part of the successor Conservative-Liberal Democrat coalition, Business Secretary Vince Cable, when asked about Kashmir in 2010, stated in The Guardian; “that is a dispute within the sub-continent that we are not expressing a view on”. Despite this overt modulation, Britain’s support for liberal interventionism – as in Libya in 2011 – causes concern for an India that remains staunchly non-interventionist and anti-imperialist courtesy of her colonial heritage. New Delhi will not be supportive of similar action in Syria. London’s contemporary willingness to engage with New Delhi is best evidenced by ties with Narendra Modi who won India’s 2014 general elections. Suspected of complicity in Hindu-Muslim violence that left thousands dead in Gujarat in 2002 – during which time he was its Chief Minister – Modi was banned from entering Britain for ten years. This boycott ended after lobbying by members of the Gujarati and Punjabi diaspora in Britain. Highly pragmatic, London’s recognition of the critical necessity of engaging with a rising India effectively surmounted lesser concerns about the new Indian Prime Minister’s political past. Taking such steps has placed Britain as a favoured state in the eyes of some Indian elites, especially when a similar ban imposed by the US was only rescinded in April 2014. Looking ahead, cementing core areas of commonality will be central to positively binding London and New Delhi together. As recently noted by an FCO official; ‘we cannot rely on sentiment and shared history for a place in India’s future … we do not just have a past together; we have a future together’. Engaging with the shared colonial past often risks reviving reviled western superiority, and issuing apologies can be problematic, as experienced in 2013 by David Cameron when he apologised for Britain’s actions in the 1919 Jallianwala Bagh massacre, and in doing so opened up unwanted questions and multiple potential grievances over Britain’s colonial past. By resting upon present-day engagement factors, such as global trade and finance, counter-terrorism and energy security, Britain-India relations must rest upon true shared interests rather than harking back to the negative legacies of coloniser and colonised. Furthermore, while New Delhi wishes to see heightened engagement, via contemporary changes to the global balance of power and greater multilateralism and multi-polarity, it must be acknowledged that India’s agency is outstripping Britain. In this context, Westminster has emerged as the courtier rather than the courted, even if the Britain-India relationship has clear mutual economic, military and diplomatic gains for both sides. Establishing Britain’s unique selling point (for instance, as an advocate for an Indian permanent UN Security Council seat) will thus be critical to ensure India’s future recognition and favour. Dr Chris Ogden is Lecturer in Asian Security at the University of St Andrews. Chris recently published the first-ever textbook concerning Indian Foreign Policy (Cambridge: Polity, 2014), as well as a book entitled Hindu Nationalism and the Evolution of Contemporary Indian Security (New Delhi: Oxford University Press, 2014), which details the rise of the ruling Hindu nationalist BJP. Bad Behavior has blocked 395 access attempts in the last 7 days.